Got some questions about switching to LINUX or using CommandCNC? Q: I am not a computer “person” and the idea of using a totally different operating system is scary. I have heard how you really need to be a Programmer to use it…..
A: First, let me calm your fears. The LINUX we use is a completely GUI (Graphical User Interface) just like Windows. Familiar things like Icons, left click and right click. a GUI File Manager that has copy-paste-move, drag-and-drop and folder type directory structure. The basic install we provide has all the apps loaded and has a desktop and menu system . You get things like a Web browser (Firefox) , Word Processor (Open Office) Text Editor, notepad (Mouse Pad) CAD program (Q CAD), Drawing Program (Inkscape), and of course CommandCNC and SheetCAM for LINUX. (license may be demo on some packages). While Programmers like LINUX because you can drop to a command line and do stuff and get to things directly in the system, you never see that unless you want to. Q: Well, I am worried about having to do everything on the LINUX system and redo all my work. A: That should not be a concern. There are three ways to move files/data back and forth between the LINUX and Windows worlds: Memory Stick, WIFI (using a USB WIFI card) or a Network. The files types and structures are the same . The LINUX box can be setup to “see” other PC’s (Windows or LINUX) and they can have shared folders that just show up in the File Manager. You can copy/drag a file over and drop it on a local Linux folder or move a file back to the other PC just as easy. Then there are the apps. A LOT of applications run on either platform including SheetCAM TNG, Inkscape, Firefox, and Open Office. That means you can start a file on one platform , move it to the other and work on it in either place. Comes in real handy if you like to draw and do the CAM (G-code) on a laptop in a cool room and you may need to do a change or edit once it gets to the cutting table. The apps look and operate the same. Q: I am starting to warm up to Linux….so why did you swtich from Windows and MACH over to LINUX and CommandCNC? A: Simple: Its Better, Faster, and Cheaper (BFC). BETTER: Windows comes bloated with lots of stuff you don’t need to control a CNC machine and Win 10 has things you simply cannot turn off. MACH3 has been unsupported for almost 3 years and is obsolete. MACH4 needs all new hardware and faster computers. LINUXCNC (more about that later) has a far superior “motion planner” that allows you to prioritize toolpath accuracy versus fastest speeds; it simply cuts complex toolpaths more accurately. FASTER: LINUX is a basic bare bones operating system that has true multitasking and is open source. The user/installer can setup the environment any way they want and only load the Apps they really want. We use a special Real Time Kernel (RTK) that is blazing fast, and provides for motion control with no delays or buffering. Inputs are FAST and in sync with motion. Direct Ethernet between the PC software and motion hardware allows for ultra smooth motion. Real time feedback allows for advanced options like our VAD that senses corners and turns and turns off the DTHC to prevent head dive. CHEAPER: Ahhh and for the final nail: LINUX is Free. 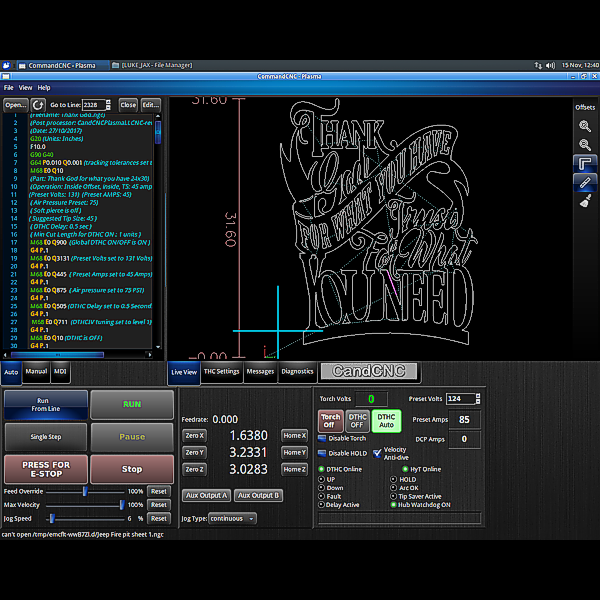 LINUXCNC is free and open source, CommandCNC is included with all CandCNC systems….Free. No expensive software to buy or pay to upgrade. Q: Ethernet? So what is that. Why not use USB. A: Ethernet is a high speed bidirectional data transfer protocol. It was designed for network traffic over relatively long distance (up to 100 meters ) in noisy environments. It uses UTP (Twisted pair cables) that are low cost and easy to install. The PC can be many feet from the Controller without worrying about external noise. Any Ethernet device can initiate a conversation (there is no Master-Slave requirements.) Ethernet uses TCP/IP data packets that have error checking and routing information. USB was designed for computer peripherals that are close to the PC (15 ft max) . It is a Master-Slave protocol with the Master (PC) having to “poll” all of the USB devices to see who needs to talk. Q: I am worried about the setup of my controls to my table. A: Take a look at our nifty GUI configuration tool (aptly named the “Configurator”. Everything is in tab form and easy to change and with a HELP button that explains each setting. It lets you define the AXIS and assign MOTORS to each (including two motors to one axis that will run in sync (aka Slaved Motor) . It shows you (only) the available inputs and outputs in the hardware, and lets you assign a function to each one. Default settings work for most basic installs . It gives you the ability to have multiple CONFIGS for different types of cutting like Plasma, Oxy-Fuel, Routing,etc. You can save a “read only” config as a Template so you can always come back and clone a new one from a Template. Q: If it’s all free why can’t I just go get LINUX off the web, install it, install LINUXCNC, set things up and use it? Why do I have to buy your hardware and pre-configured PC? A: Remember when I said LINUX is liked by Programmers? It’s because in its raw form, it’s more of a framework than a turnkey product and it’s highly flexible . Setting it up for general applications is pretty easy. It’s a bigger issue to setup a real time CNC controller. The Latency of the PC hardware is vitally important and there are system settings that have to be done to optimize performance. We pre-load the PC and test it with the controller, and we provide recovery memory sticks for restoring the LINUX install and the base level CommandCNC install. We release Updates on the website that are one click installs. Q: I keep hearing “CommandCNC” what is that? 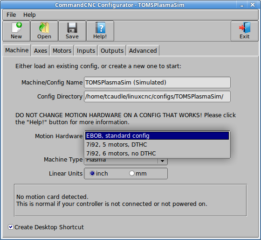 A: CommandCNC is the trademark name of the CandCNC application for LINUXCNC running on LINUX. LINUXCNC is a general purpose CNC control program . It’s open source so it can be modified (and has, by us and others) . 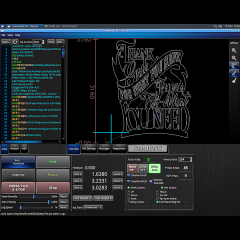 CommandCNC is the hardware drivers, Screens, Widgets,, communications and configuration tools. The best analogy is that LINUXCNC with CommandCNC is like MACH or another Windows control program but running a cleaner, faster, smaller operating system. Q: So how hard is it to learn CommandCNC or how to cut with it? A: No harder than any other PC based CNC control and in some cases easier. Once setup CommandCNC is just a graphical interface to the machine hardware . If you are new to CNC and especially to computers, you will find the artwork creation as big a challenge as running the machine. Q: I see a lot of controllers tout how easy they are to use citing a single application that does it all: Drawing(CAD), Toolpath (CAM), and doing the actual cutting. Sounds pretty simple and I want simple. A Riding a bicycle with training wheels will keep you from falling down, but it lowers the flexibility of what you can do . It’s great at the beginning and a hindrance to a more experienced rider. So it is with CNC. An All-in-One package is probably easier to learn in the beginning and may be just fine for a lot of users. Since its all together you can’t change out any of the parts if you don’t like them, and if it lacks a feature, you have to wait for that one vendor to add it. Your only source of support is that one vendor and often you have to upgrade (at $$) to get something in one part while paying for a total upgrade on other parts you don’t need. By separating out the the three C’s (CAD-CAM-Control) each one can be changed to suit your needs. Having separate applications affords you the flexibility to do whatever part of the three processes where ever and whenever you want, on the same or different PC’s and platforms. Do your drawing on a laptop in a temperature controlled room , generate the cut path (G-code) there or on another PC (or move it to the cutting table ) and then pick what process you want to do in the Hot Dusty Shop. Q: I just want to scan and cut . Doing a drawing is too complex for me. I watch videos and it looks easy to just scan it and punch a button to cut. Q: I notice all your bundles include SheetCAM, why? So can I use something else? A: SheetCAM is a cost effective 2D and 2.5D plasma and simple routing program. It’s simple to learn and easy to use. It takes vector format drawings in either DXF or SVG and presents them on the screen and lets you control exactly how you want the shapes (contours ) to cut. You can import multiple parts. You can step and repeat a part or group of parts (nesting) . You can break your job into multipe groups of cuts and into multiple “operations” for complete control of cutting parameters and cut order. Advanced cut features like “Soft Pierce” and Cut Amps Preset (requires Hypertherm Rs485 Serial port Option and CandCNC HYt-Connect SIM Kit) increases pierce thickness and increases consumable life. Programmable “Cut Rules ” that solve difficult cutting problems. You can use another CAM program but you lose a LOT of features. Q: How easy is setting up a router and doing work in wood, plastics or thinner aluminum? A: It’s a process of swapping out the torch holder for a router mount on the table and picking the Router Config off the Desktop. You can plug your router into the AUX 1 output on our controllers that swtiches 120VAC and it will turn it on an off at the correct times The Router POST for SheetCAM allows for Contour (outside cuts on a shape) and Pockets (routing away an area to a defined depth and flat bottom) . The POST for SheetCAM allows for a manual or semi auto (with a touch probe) toolchange. For Decorative carving we support the Vetric line of software and we have POSTS for CommandCNC. I will leave the physical logistics of switching from plasma to routing and back to the user. Q: So what if I buy a table with a CommandCNC Control and I have problems? What if I build my own and simply cannot get it to work even with help from you guys? A; If you buy a table used or from one of our certified OEM’s, the warranty transfers to the legal owner. Phone support is available on in-warranty (24 months) systems and online support on older units. We ask you to first attempt to engage the OEM / table vendor you got it from and we support them. If they cannot help, you can always contact us. We can’t fix a bad mechanical design but we can make our controls work as advertised . If you build your own from scratch or a kit, we are your direct support conduit. We have thousands (not hundreds) of units out. We have a very active Support Forum that is open to owners and potential owners, and it hosts a large community of users that can, and often do, help. Units in warranty can be sent back for testing and calibration with the only charge as shipping. We stock spares for systems up to 7 years. we have a liberal upgrade policy. If you still can’t make it cut or you are struggling with the software and drawing side we offer a structured training class in our dedicated training center with experienced instructors in a hands-on environment. The NTTC (North Texas Training Center) is a new option starting July of 2018. We will publish a course description and schedule in May 2018.